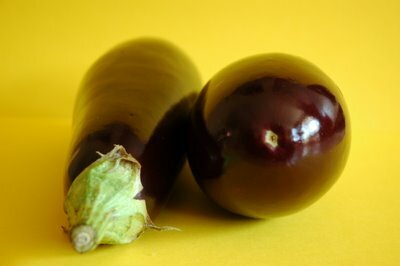 Aubergines are awesome. I love them and they are found very commonly in Italian cuisine. What did I make with this? I know it was not fair from me to keep you waiting. But I am sure you will love what I am about to serve! How many of you have Jamie Oliver's "Jamie's Italy"? I am sure there are plenty of you all nodding or raising your hands at this moment. Isn't it great? I liked Jamie before, especially for his fantastic offensive for healthy school meals in the UK. If anyone has seen it on TV will agree with me that what he achieved was amazing! Now, I love him! After spending a few months in Italy, he has come out with this book/cookbook with so much more than just recipes.This would have been my kind of trip, Jamie! Pam and I wanted to surprise you with something different today (I won't spill the beans yet) but the surprise has been postponed till next week, as Pam is in bed with the flu. Hope you're feeling better, sweetie. 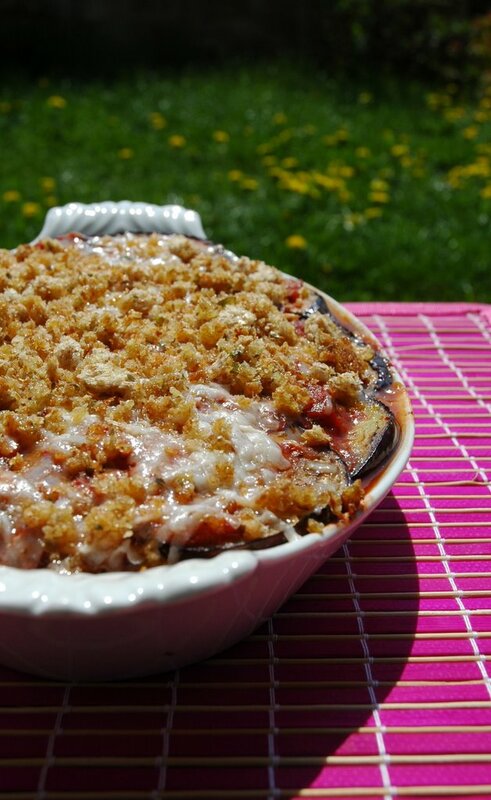 Jamie's gorgeous aubergine tomato gratin with lovely fresh tomatoes, aubergines, parmesan cheese and the herby scent of oregano and basel makes it a delight to relish. It is a simple yet gorgeous dish that can be served on the side or as a main meal. Jamie recommends grilling the aubergine slices on a barbecue grill. I am sure this tastes great as it leaves the flesh creamy. I used a frying pan with grill perforations instead and fried the slices until slightly brown in olive oil. Once you have cooked the aubergines, using whichever method you prefer, set aside. In a pot heat up some olive oil and sauté the oregano, onions and garlic. Add the tomatoes and simmer for 15 minutes. After the sauce has thickened, add the fresh basel, salt and pepper and a squirt of the balsamic vinegar. Jamie also recommends to puree this sauce but I did not do this as I prefer to have a few tomato pieces in the sauce. In a oven proof dish pour a bit of the sauce to cover the bottom. Sprinkle some cheese over this and add a layer of the aubergine slices. Repeat this process, leaving the top layer with sauce and cheese. Mix some dried oregano in the bread crumbs and fry in some olive oil until nicely toasted. Sprinkle this over the top of the gratin and bake for 30 minutes. I served this with some garlic foccacia bread. But it can accompany any meat dish too. I had pre-prepared this in the afternoon and baked it for 15 minutes, so that in the evening it just needed another 15. After I had prepared it I carried on working on a project in the living room. I had the aroma of this dish in my nose the whole time. So by the time dinner came around I was salivating over it. 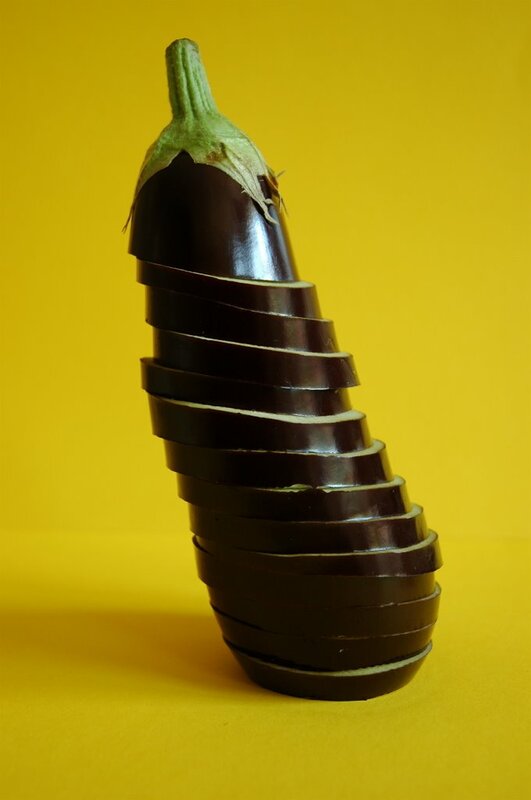 I was not too sure how Soeren would take to just plain aubergines. He has eaten them several times before but always mixed with other things. For some reason when I spooned a portion on his plate he thought it was spinach. When he started to eat it he really liked it. Watching him as he spooned it into his mouth was like literally seeing the taste bud lights go on in his brain and slowly his lips formed into a smile and then a "ummmm! Tastes great, mama!" Tom also mentioned that the house smelled delicious!? When I served the gratin he could not believe simple looking dish could be the cause of such heavenly aroma. But he had to confirm that a few simple ingredients can make up some of the most desirable tastes. WOW..how did you get it to stand up like that..it is amazing! or is just an illusion, is it actually resting the yello board..but I see a shadow..hmm..too many questions..lemme know.. I was cutting up the aubergine and mindlessly stacking them like this. I took a step back and thought if I put the end on it, it would be perfect for a pic. It is not an illusion ;-) it is standing not leaning against anything) on the yellow board just like you see it. Well well well, I would have guessed that it's kinda sitting on the board and you have rotated the pic- but you say it's standing by itself- like a house of cards?? MEETA -- there's something AMAZING happening in your photos these days! Thanks for the dedication, I'm feeling a little better today and look forward to our surprise next week! I think its my first time visit here. Beautiful pictures and lovely recipes. You do magic with your pictures. Do you offer any teaching lessons on food photography online? I am in. Choose a different career, NOW i.e. food photography! The dish looks very good. I do like Jamie Oliver myself. Funny thing though, I made a Jamie Oliver salad dressing for my salad today. It is posted on my blog :). If I may say so, Jamie fan's think alike? Amazing pictures and a greatrecipe meeta. I am going to try it :). I cant stop talking abt the pic... can u tell that?? You keep going like this and I will have to post more than one comment on each of your beauties.... 3 huge aubergines and 1 kg tomatoes, I'm sure this would have served some 8 ppl right? or does the thing cook down a great deal? RP, you flatter too much. I am a beginner myself. Thank you for the lovely comments. Hey Luv, great cooks think alike ;-) Thanks for the comment, but I still think I'll stick to my day job!! Shilpa, let me know what you think! Santhi, it did taste good but I am glad you liked the pic! Nandita, I am like you I cook for a small family with BIG appetites. Actually the sauce cooks down very much! Once again everyone - I thank you for your kind words. greatly executed! hats off. i was looking for the recipe for the melanzane alla parmigiana and found your blog. Meeta, I made this today and Im going to post it on my blog as ur dish and i just want to say that this was awesome !!! The house was filled with such aroma , I cant tell you , simple but tingles the taste buds!! Thanks for the feedback. Great to know you enjoyed.